Just like indoor Christmas trees, outdoor trees are begging to be brightened at this time of year! Outdoor Christmas tree lights can be wrapped around branches, weaved in and out between the foliage and outdoor decorations, or they can be used to decorate around the base of the tree. With an extensive range, filled with a multitude of different colours, styles, designs and lengths, we have the perfect lights for you. 24 LEDs per 3 metre length. The tradition of putting lights on Christmas trees originated in Germany in the middle of the 17th century, although the lights used then were real candles and not the miniature electric bulbs we know and love today. Thankfully, advancements in Christmas tree lights technology have given us the use of LED (light-emitting diode) technology. LEDs are not only much safer than having an open flame on your Christmas tree, they are also far more efficient than their previous incandescent counterparts and boast a much longer lifespan. Further advancements have meant that certain LED string lights have been manufactured to boast waterproof ratings, ensuring that they will still function to the same high standard when used outdoors. 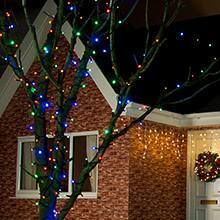 Twinkling lights on outdoor trees never fail to instil a sense of festive cheer into all who see them, and with an abundance of different colours, styles, designs and lengths available, you can turn your garden into a grotto! Prepare your garden ready for our outdoor Christmas tree lights. Explore our high-quality range of outdoor fairy lights and answer all your seasonal wishes. These decorations make a great all year-round display of spectacular visuals towards your outdoor space and home. 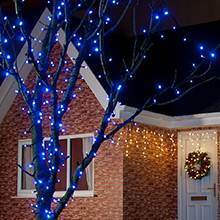 Always a great attraction is displaying connectable fairy lights outside on trees, hedges or fences. There’s a wide range of colours you can choose from to enlighten your garden and the choice of having multi coloured lights. Our outdoor connectable string lights provide a stunning seasonal feature towards your garden. 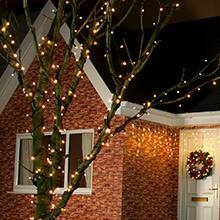 Be creative and apply these cabled lights around any fences or trees and hedges within your garden. These superior LED lights contain 8 different modes which feature slow fade, twinkling, static, slow-glow, in waves, sequential and flash. All of which are a fantastic asset towards your garden, making that warm Christmas feeling come to life. Another great asset towards your outdoor space is introducing the colour changing LED string lights in your garden. They bring a positive and brightly coloured vibe into your Christmas spirit. They’re easy to wrap around objects such as trees and hedges. All outdoor lights are waterproof and completely safe, so you can rely on your lights to illuminate your home up with no issues. Consider our festoon lights for your outdoor environment, they’re the perfect source to bring in raw energy towards your home. There are eight different functions you can select from, including; combination, in waves, sequential, slow-glow, flash, slow fade, twinkling and steady on. These functions have a built-in memory chip and will automatically select the last function you used. Another useful function is the built-in timer, the lights will remain illuminated for six hours and after that, they will automatically switch itself off for eighteen hours. Then the lights will turn themselves back on again at the same time, just as one continuous cycle.